Sometimes a picture is worth a thousand words and the photo from a recent New York Times blog article says everything about our water crisis. 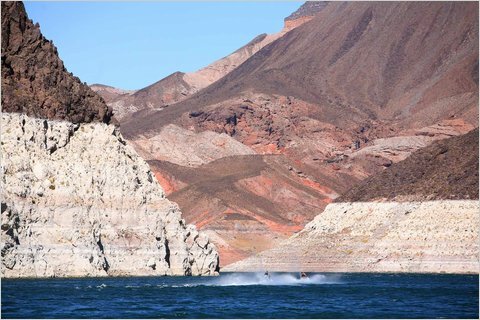 "Sometime between 11 and noon on Sunday, the water level in Lake Mead, the massive reservoir whose water fills the taps of millions of people across the Southwest, fell lower than it ever has since it was filled 75 years ago." Lake Mead is the largest resorvoir in the Unites States and while it is still 8 feet (a whole 8 feet!) above the levels where a shortage is officially declared, if the levels drop too low not only will our water supply be dangerously low but it could also effect the hydroelectric output of Hoover Dam. Comments on the article range from blaming climate change and evaporation to blaming our wasteful building practices in the Southwest. Either way there is one obvious conclusion: we need to start getting serious about water conservation in the Southwest! There are tons of tips for conserving water at home whether you own or rent and while conserving household water use is a huge help to our water supplies we should also remember that 70% of the average household's water use in the Southwest goes toward irrigating our landscapes (lawn and tropical gardens). In order to become truly sustainable we need to change the way we look at water use both inside and outside the home.